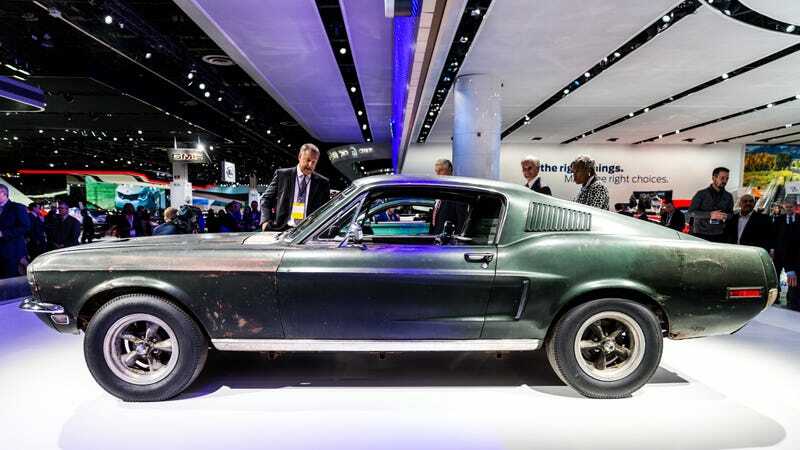 Ford trotted out the 2019 Ford Mustang Bullitt at this year’s Detroit Auto Show, along with a highly special guest: the original Mustang used in the 1968 Steve McQueen film, Bullitt. Jalopnik’s on-hand photographer Kurt Bradley got a close look at the iconic car that was, until just a few years ago, thought to be lost. Seeing the old and the new car next to each other lets you see how small details from the original, like the cue ball shifter, have made it into the current homage. Kurt reports that the original smells like Old Spice, cracked leather, splintered wood and rich fuel mixture. He may or may not have been kidding. The Bullitt Mustang is on display at the moment, but it’s unclear if Ford will keep it on the auto show floor during the public days. I imagine they’ll remove it, since it’s quite valuable. This car is probably worth A LOT of money.